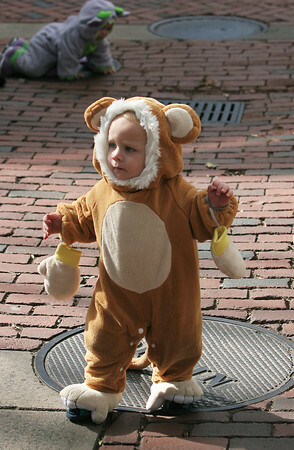 Salem: Bradley Nicosia, 1 of Lynn, curiously walks down Essex Street dressed in a monkey costume while his cousin, D.J. Santos, 10 months also of Lynn, crawls across the bricks on Thursday afternoon. The two children learned how to walk a few weeks ago and their mothers decided to enjoy the nice weather in Salem before all of the crowds arrived for Halloweeen weekend.